Y-650 pager is easy to use, durable and reliable. It is designed to be a watch like style. It is compatible with any call buttons and offers the longest range avaliable. It is suitable to use in restaurant, hotel and coffee shop. 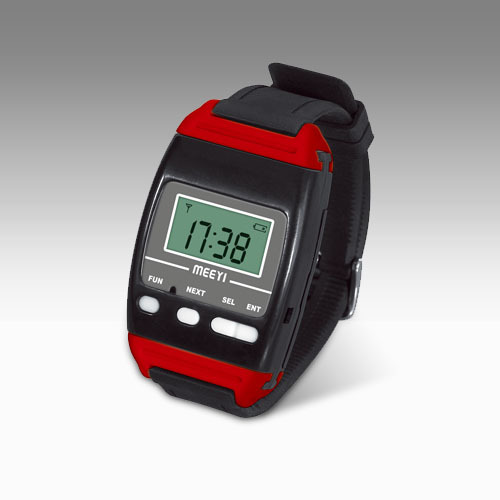 3.High brightness LCD display with 3 alert modes: ring, vibration or ring&vibration. 4.Work with 1-key and 3-keys call button. For example, Y-A1,Y-A3,Y-B3 and etc. 5.3 paging modes: symbol, text or symbol&text. 6.Holds up to 10 messages. 7.Compatible with 200 call buttons. 8.Display the current time in standby mode. 9.Support 2 different frenquencies: 315Mhz or 433MHz.